I received a new Rec Tec Grill to review this Spring and we have enjoyed creating new recipes to cook for family and friends to enjoy. I have immediately fallen in love with the fact that I do not have to use my oven and my Slow Cooker enjoys the fact that I can give it a rest every now and again. 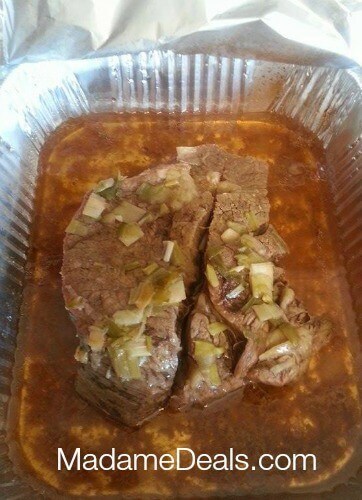 My latest creation has been a delicious and moist Grilled Beef Recipe Roast. This recipe did require some marinating over night so a littler preparation is required but it only takes about 15 minutes the night before. Keep reading to find out how you can create this tantalizing Grilled Beef Recipe Roast for your family and make a meal that everyone will ask for over and over again. In a Medium Bowl combine all the above wet ingredients, mix well to completely dissolve the mustard. Add in brown sugar, salt, pepper and green onion. Stir until brown sugar is dissolved. Combine the marinade with the roasts in a large bowl or an extra large leak proof ziplock bag perfect for marinading. Place Roast in Roasting Pans (I recommend the disposal ones for easy clean-up) and cover with aluminum foil. Cook for 2 – 2 1/2 hours or until completely cooked. Remove let sit for 5 minutes and then slice and serve. Check out the other delicious recipes we have cooked on our Rec Tec Grills. Read our full review of the Rec Tec Grill. Cook for 2 - 2½ hours or until completely cooked.